The Hidden Valley Inn is a luxury resort and ecotourism destination in the Mountain Pine Ridge/Cayo District of Belize. Imagine the tranquility of 7200 acres of private reserve - a place to enjoy the simple pleasures of quality accommodations, fine food and attentive service, where you can walk into a world unspoiled by man and experience a unique contact with nature. The flora, wildlife and birding at the Hidden Valley Inn are like no place on earth. Guests enjoy exclusive access to 90 miles of hiking and mountain biking trails as well as many secluded pools and waterfalls set in tropical rainforest. For those seeking romance, use of one of the waterfalls may be reserved exclusively for the day. This small luxury hotel comprises of a central lodge surrounded by only 12 cottages guaranteeing privacy and some of the most personalized service in Belize. 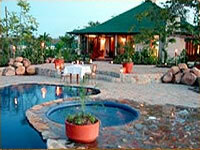 The resort is the only accommodation in this private reserve! The Hidden Valley Inn also serves as a convenient base for visiting the various scenic attraction of the area. Canoe trips are a peaceful way to observe the indigenous fauna and flora, horseback riding through the jungle is a unique experience, mystical caves can be explored on foot, by canoe or tube whilst ancient Mayan cities and modern day rural villages provide a glimpse of past and present cultures.